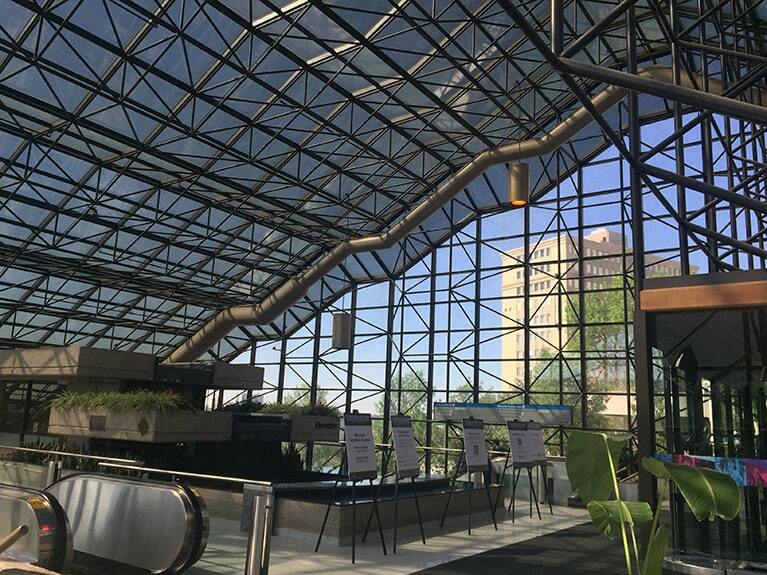 The Shaw Conference Centre Atrium public art competition, open to professional artists residing in Alberta is held in accordance with the City of Edmonton policy “Percent for Art to Provide and Encourage Art in Public Areas” (C458C). A defining landmark of Edmonton’s cityscape, for 35 years the Shaw Conference Centre has hosted conferences, concerts, social events, weddings, and graduations. The iconic atrium, which cascades down a slope overlooking the North Saskatchewan River Valley connects, Jasper Avenue with the valley below and the prairie sky overhead. Designed by Edmonton architect B. James Wensley, 70% of the building (300,000 square-feet) is located underground. From ground level to the top of the atrium, the building measures over 10 storeys high. Visitors are transported from the atrium to the conference spaces below via an indoor funicular. The fully-glazed atrium affords visitors a 270-degree view of the North Saskatchewan River Valley and its associated parks. The conference centre is about to undergo a substantial rehabilitation focusing on the signature atrium. Upgrades to the building envelope, structural, mechanical and electrical systems will allow the facility to reduce its carbon footprint and adopt sustainable practices that will assure its role as an Edmonton hub for decades to come. The plan is the result of a collaborative conversation between representatives from Shaw Conference Centre, the City of Edmonton, architects, engineers, industry specialists and designers. The Edmonton Arts Council, on behalf of the City of Edmonton, seeks an Alberta artist or artist team to create an artwork to be installed early Winter 2020. Emerging artists and/or artists not currently represented in the City of Edmonton Public Art Collection are encouraged to apply. RSVP is required by Wednesday, November 7, 2018 (see contact info below) – the event will be cancelled with low response. City of Edmonton & EAC Public Art personnel will outline the specifics of the project and requirements. The Edmonton Arts Council is committed to equity in all aspects of its work, and invites proposals from all potentially interested individuals. We thank all applicants for their time and professional interest in this call.